Meet Shuubun, a recent piece of abstract art. 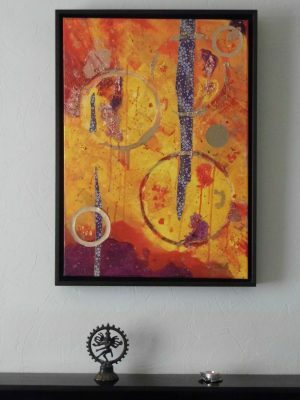 It’s one of a batch of paintings that I’ve had framed in the past year. It’s a good feeling to complete a painting such as this vibrant slice of autumn, especially when I add the signature. And since we were close enough to the autumn equinox when I did, I thought that something along those lines would make a decent enough title. 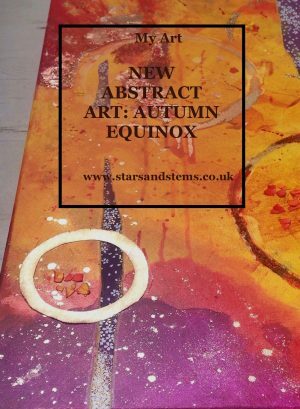 But hang on, I’ve already got a painting called Equinox. I would have to find a different name. That’s where Google Translate comes in when I’m stuck for names. Many of my paintings have Japanese titles because a) I lived in Japan b) I kicked off my art career there and c) chiyogami paper!! Show me a painting I’ve done lately that doesn’t have any. It’s a bright affair because despite the days getting shorter at this time of year, in the northern hemisphere at least, it’s also an energetic time. Big bursts of colour are having a final flare-up before shivering under fluffy white blankets (or more likely grey), until nature glows again in the distant spring. The light fades as we near year’s end in the northern latitudes. And yet it’s at its most exquisite. Autumn always has the best sunrises and sunsets as well as the best foliage, albeit dying. It makes a great sound as you scrunch it, which the textured surface hopefully suggests as well. The light fades as we near year’s end in the northern latitudes. And yet it’s at its most exquisite. The golden circles suggest the constant turning of the year from one station to the next and the gifts the changing seasons bring us. 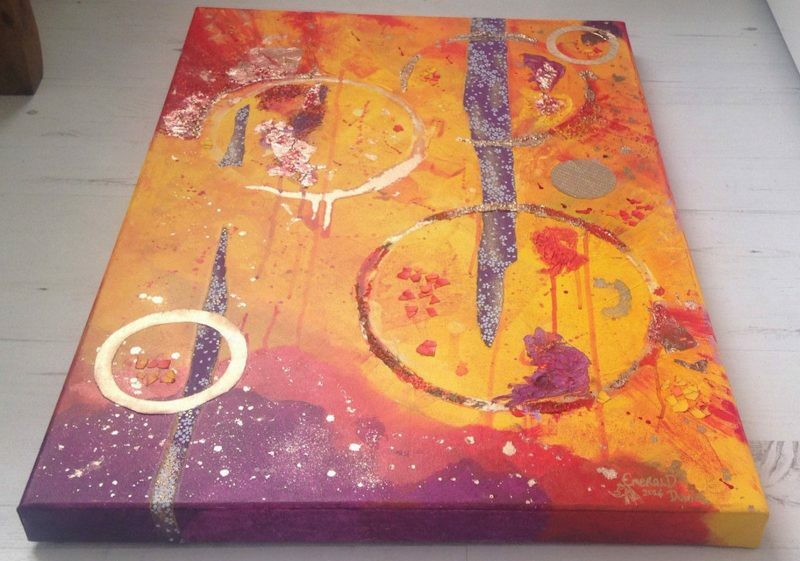 I created Shuubun with acrylic paint and gold dust on silky linen canvas, my favourite surface to work on. 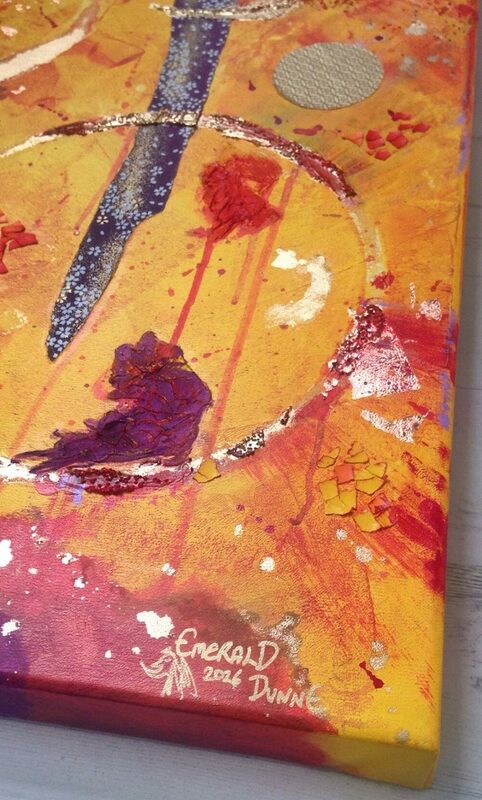 Like most of my abstract art pieces of late it contains egg shell, gold leaf and luscious chiyogami paper from Japan, this time from a purple batch I particularly like. For paints and texture products I’ve built up a good supply of Liquitex items* in my studio, especially their Soft and Heavy Body Acrylics. I first started using this brand in Japan and also rate their glass bead gel for adding a tactile quality to my work (tactile to the eye that is, not sticky fingers!). This time I sourced my chiyogami paper from an Ebay outlet rather than head back to Japan to replenish supplies. I fear it’s not my first visit to my new Ebay discovery. I often use egg shells and/or sand in my paintings, so some more economical – and natural – products are in my work too. Some of the photos here are unframed. Because it’s a gallery frame, i.e., a deep one (4cm), you can get away with leaving it so. I often paint the sides a contracting colour and many artists “follow” the painting around the edges. However, now I’ve seen this work sitting in its gorgeous wooden box-frame, I can see how beautifully finished off it is. A wise writer friend named Daniel once said that a painting needs a frame, just as a beautiful face needs a great haircut (he surely must have meant his own! 😉 ). Shubuun is is a medium-sized painting measuring 55 x 80 x 5cm in its dark brown frame. The guys at Kelvin Framers then fitted D-rings and string to the back so it’s ready-to-hang. Now all you need is a wall. 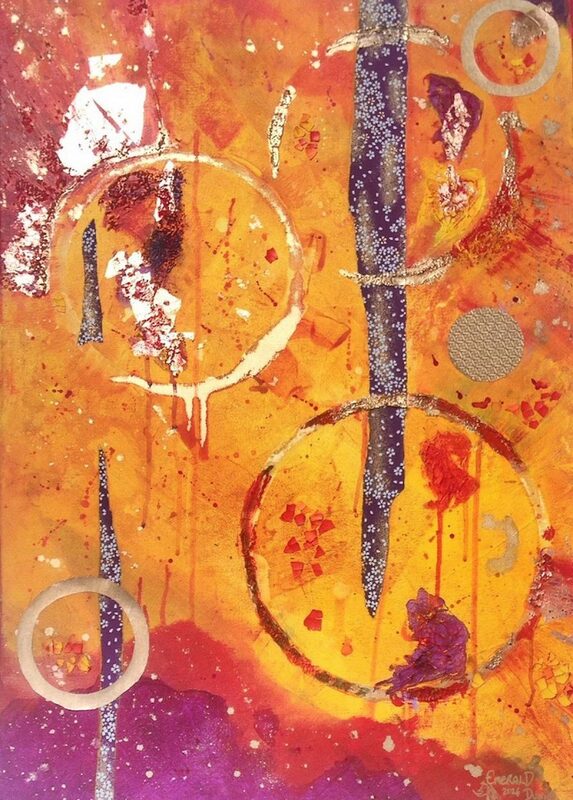 Like most of my abstracts, this features in my Etsy shop. Click on the link to see Shuubun here. * NOT a sponsored post. Liquitex is my go-to brand of choice. "The Bass Rock in the fog: Atmospheric"
"I want to live in St.Ives!"